Cutting up fruit takes so much time. I found this on Pinterest and it took five minutes. Wash all the fruit including the melon. Place it on a plate with a lip so the juices don’t spill. Slice in triangles like you would a pizza. 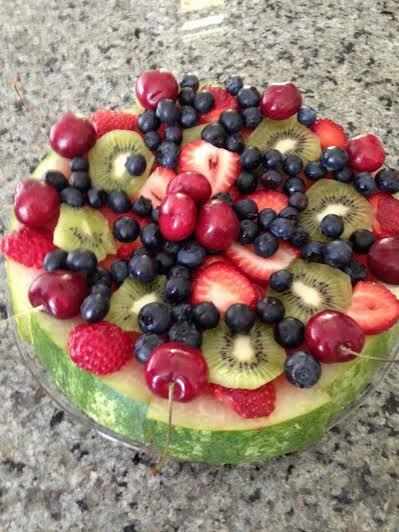 Start placing the fruit on each slice. You can use whatever you like. All my raspberries disappeared before I even got started. I didn’t add the coconut because I have one child allergic to it. I’m sure pineapple, orange segments, grapes or any other melon would be delicious. This is so easy to serve. Use a pie server and place a wedge on each plate. Let the children decorate their own with the smaller slices. I guess I have become the real Italian Mama. It doesn’t matter what I am cooking when my children come to visit. I always have a big pot of meatballs sitting in a tomato gravy on the stove. 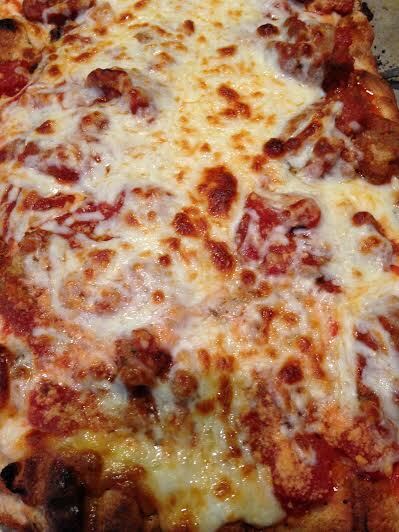 The meatballs become a snack, appetizer or a meal. This week I had four lonely meatballs leftover. I also had a pound of pizza dough. Flatten the pizza dough to fit the pan. Drizzle with olive oil, salt and black pepper. Take the dough off the pan and place it on the hot grill. Don’t touch it till the bottom of the crust is firm and it starts to puff. Place it back in the pan. Cut three slices of provolone cheese in half. Place them on the grilled dough. Slice the four meatballs into medium thin slices. Heat them up and set aside. Place them on the cheese. Sprinkle with grated Romano cheese. Place on the grill in the pan or in a 450 degree oven until the cheese melts. This only takes about five minutes. Great way to use up your leftovers. So easy, so good and so good for you. The amount of liquid depends on how big the cauliflower is. I fooled my kids for years. 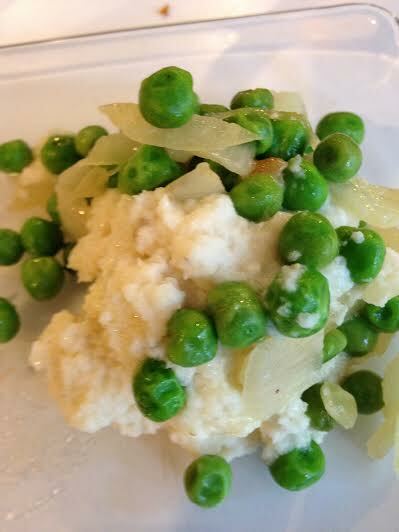 I do serve this with Angies’ peas. This is a great combination and two vegetables in one meal. My Mom could cook anything and make it taste good. Saute the onion in the butter and oil till soft. I serve these with whipped cauliflower or mashed potatoes. This is the year for strawberries. I have been taking full advantage of them and putting them in everything. I think I am starting to turn pink. Only kidding. Now they are standing alone in a delicious dressing. This can also be used as a dipping sauce for chicken or vegetables. Mix strawberries with sugar and let sit for ten minutes. Put everything into a food processor and process till smooth. This is a pretty color dressing. I made one salad and loved it but then I started to add things and liked it even more. 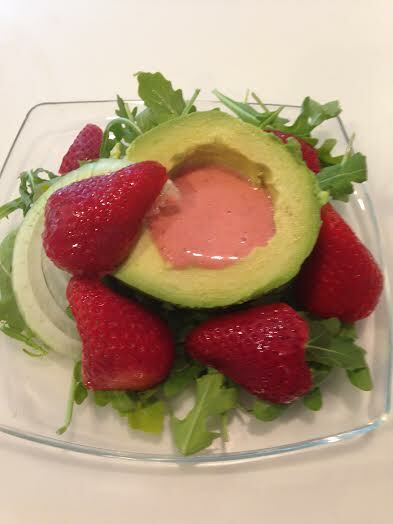 Add goat cheese, avocado, cubed mango, fresh sliced strawberries and chives. My sons love this and once in a while I do indulge them. Add the onion and pepper. Stir to cook but keep the onions almost raw and crunchy. Add the meat and cook till medium well. Add eggs and scramble till cooked. You can add cheese now if you like. I decided to be a little healthy and add pea shoots. 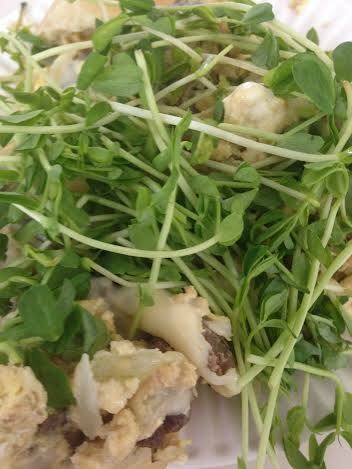 The pea shoots took away the guilt of eating beef for breakfast. Sometimes you don’t mess with Betty Crocker. She has a limited edition cookie mix that is delicious and of course easy. 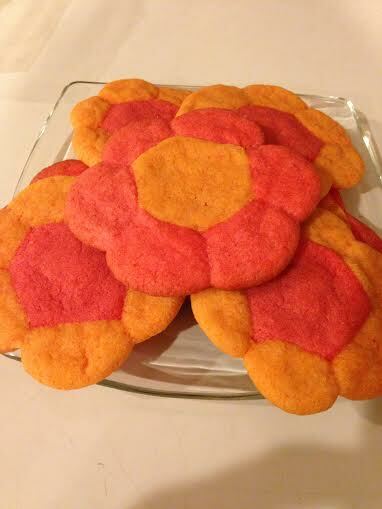 It is the Betty Crocker Orange and Raspberry Sherbet Cookie Mix. Go to the store and buy all they have. I made these last night to give away and only a couple made it out of the house. This is also a great project with the kids because they can make all different designs. It is a very forgiving dough. Just follow the directions on the box. The cookies are pretty and delicious. They really taste like sherbet. Next time I will serve these with a scoop of sherbet. Betty Crocker gets an A plus from me.